At the time of the Spanish rulers in Peru the Sacred Valley and Cusco were very poor. Cusco had lost its political importance and the Spanish rule was considered cruel and humiliating. Mining was a huge economic gain, so the Spanish used Quechua laborers to work in the mines. According to the narration one of the miners, Diego Quispe, was standing up for one of his co-workers, who was beaten by a foreman. The following day Diego was imprisoned. Fearing for his life, he escaped to the mountains of Huanca. When the sun came up, he sought refuge in a cave and hoped that he would not be found by the Spanish. At nightfall he came out of the cave to look at the sky. He noticed that there was no moon. Suddenly a light appeared. It was Jesus Christ, still bleeding from the beatings he received. The holy man spoke to him and told him to leave in the morning and go to Chinchero. There he would find a priest for communion and then he should return. Diego went to the town of Chinchero. Finding the priest he returned to the cave with a group of people. While Diego was showing the place of the apparition, the priest ordered Diego to enter the cave and ensure the presence of Christ. Shortly after, Diego called the priest and indeed Christ was in the cave with fresh wounds. He also called the others to witness the apparition. This is known as the first pilgrimage to the Lord of Huanca. 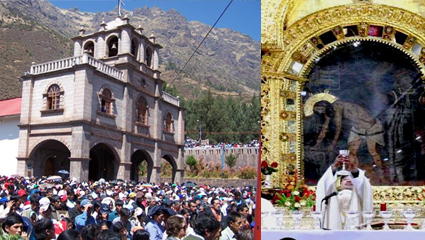 Each year on September 14th, Peruvians and people from neighboring countries (mainly Bolivia) come to walk the Pilgrimage route of Señor de Huanca close to Cusco. At almost 50 kilometers from the Inca capital, at a height of 3,100 meters (up to 4,250 meters), it is a tough and cold 6 hour hike in the middle of the night. At the end of the trail there is a painting of a wounded Christ on a rock greeting you. The pilgrimages arriving at the spot will cleanse in the pure waters of the spring, hoping for good karma for the rest of the year. Prior to the day of the walk a week filled with festivities takes place.